Well, I was just wondering the other day what if anything had ever happened with that ridiculous case in Italy where seismologists were charged with manslaughter—manslaughter!— for telling people not to worry too much about an earthquake (which then happened). See Italy Actually Going Through With Manslaughter Trial of Seismologists," Lowering the Bar (Sept. 19, 2011). I'm glad to report that the Italian court did the right thing and dismissed the charges. Just kidding! Six years in jail for each of the scientists. The prosecutors insisted the case was not about predicting earthquakes, but rather was about whether the defendants had misrepresented the risk of a major quake, causing people to stay home who might otherwise have fled. 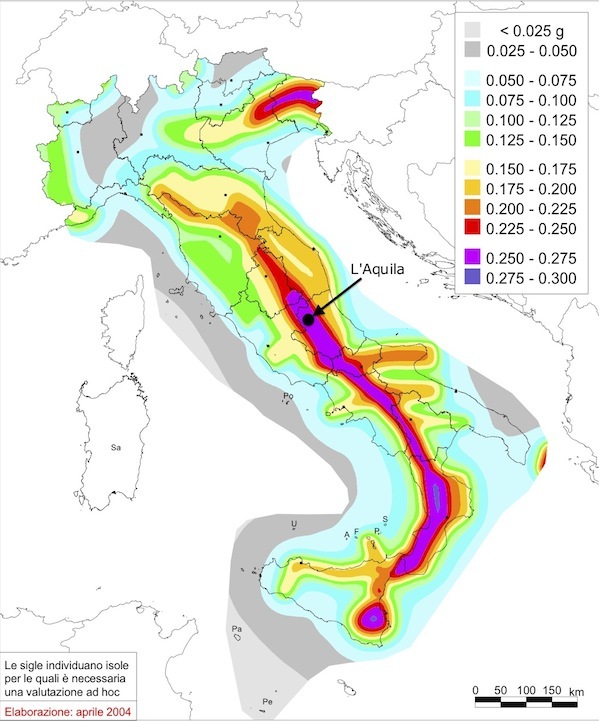 Over 300 people were killed in the quake in L'Aquila, and some people testified that their family members had stayed home only because of the experts' statements downplaying the risk. Under California criminal law (as in many states) "involuntary manslaughter" is "the unlawful killing of a human being without malice … in the commission of an unlawful act, not amounting to felony; or in the commission of a lawful act which might produce death, in an unlawful manner, or without due caution and circumspection." ("Voluntary" manslaughter is a killing in the "heat of passion.") I don't think anyone claims talking about earthquakes is "an unlawful act," so the issue would be whether they caused the deaths by committing a lawful act "without due caution and circumspection." That is, it's basically asking whether they were criminally negligent. Under civil law (and I still have trouble believing they were charged with a crime), this would most likely be an allegation of "negligent misrepresentation." That basically means the defendant said something that wasn't true, maybe even honestly believing it was true, but with no reasonable grounds for believing it was true at the time; someone then relies on the misrepresentation and is injured as a result. Again, were they negligent/did they act unreasonably? The answer is no for at least two reasons. First, it is not unreasonable for a seismologist to say, "don't worry too much about an earthquake." (Paraphrasing.) This was said at a time when many small tremors had recently occurred, and so people were on edge. But saying, as one of the scientists did, that there is "no reason to believe that a series of low-level tremors [is] a precursor to a larger event" cannot be unreasonable BECAUSE IT IS TRUE. (It also can't be false, BECAUSE IT IS TRUE.) There is no way to predict earthquakes and no science saying that many small quakes necessarily means a big one is coming. You could just as well argue that had they said, "head for the hills!" or the equivalent, that would have been unreasonable because there would have been no good reason to think a big quake was coming. In fact, the risk of death would almost certainly have been much greater if people jumped in their cars and fled. With hindsight we know it was better to leave, but no one could have known that at the time. And here, since we are talking about a misrepresentation, there's no causation unless the person who heard it relied on it. That reliance also has to be reasonable, and where earthquakes are concerned, people ought to know that there is no good way to predict them and that you have to take all kinds of precautions no matter what "experts" say. That's especially true if you are in a known earthquake zone, which the area around L'Aquila definitely is. (Map source: INGV via Chris Rowan.) So for that reason, too, there should be no liability here. Now, under Italian law, the analysis is slightly different. There, you cut open a chicken and look inside, and if the chicken's entrails look funny then the defendant must prove he is not guilty or else successfully accuse somebody of witchcraft. Probably this put the scientists at a disadvantage, but the law's the law. Seriously, Italy. The Renaissance started in you, and now look at yourself. Apparently the seismologists will be free while their sentences are appealed. Have the higher courts heard of this "science" business? Time will tell.